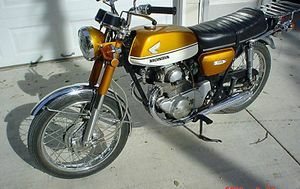 The Honda CB175 was a 175cc, 4-stroke, OHC, street motorcycle manufactured by Honda from 1969 through 1975. 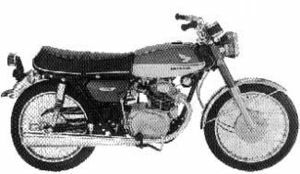 The CB175 was a high revving engine producing 20 bhp (15 kW), this was a beefier version of the CD175 but with twin carburetors and wilder cams. This bike was made keeping single purpose in mind i.e. excess of fun and performance combined with excellent styling. Top speed was increased to 85 mph (136km/h) with better acceleration compared to 80 mph(128 km/h) of CD175. But all of this came with a price as exhaust valves gave in early and engine had a relatively shorter life. 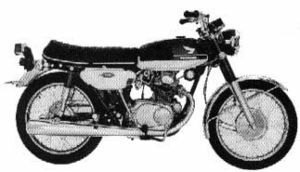 The CB175 came equipped with a tachometer, round stretched out turn indicators, flatter handle bars, Honda logo on fuel tank and an electric starter. 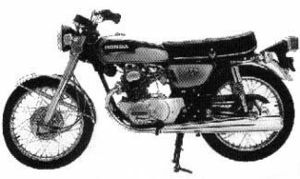 The CB175K3 Early model Super Sport 175 was sold in 1969. It came in one of two colors: Candy Blue with White or Candy Orange with White. The gas tank was a two-tone with a black rubber pad. The "HONDA" tank emblem was in the white section. The side cover was white. 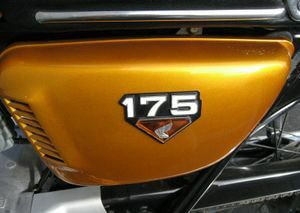 The "175" emblem was white and the basic color (blue or orange). The seat surface was not pleated. 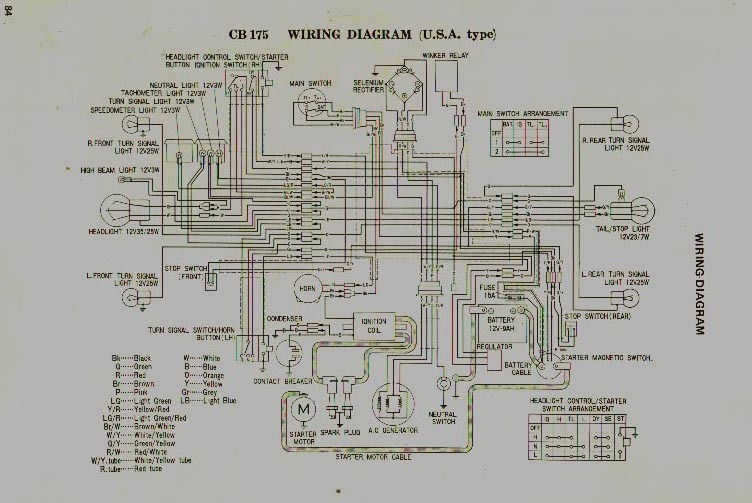 The electrical system was 12-volt. 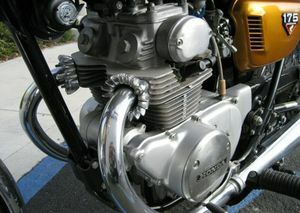 The engine was a 174cc OHC parallel twin linked to a 5-speed transmission. The serial number began CB175-4000001. 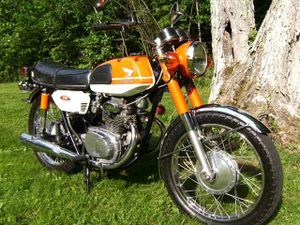 The CB175K3 Late model Super Sport 175 also sold in 1969. It also came in one of two colors: Candy Blue with white or Candy Orange with white. The "HONDA" tank emblem was in the color section. The seat surface was pleated. The rear shock springs were concealed. The electrical system was 12-volt. 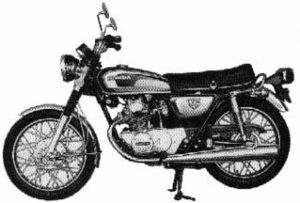 The engine was a 174cc OHC parallel twin linked to a 5-speed transmission. The serial number began CB175-4000001. With 20 bhp @ 10,500 rpm, and a slick 5 speed box. The K4 was soon to replace this without knee pads and different shaped side panels, which were also colored not left in 'the white'. 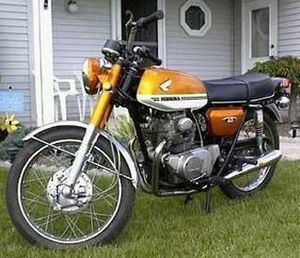 Faster than the CB72, but not the CB250K0 which was the quickest four stroke 250 produced until the CBR250RR some 30 years later! This chassis was shared with the CB125K3 model, but of course with a totally different engine sharing no common parts, and the CB125K3 had a very stylish rev-counter/speedo in one body let into the headlight in true 'Sixties style! 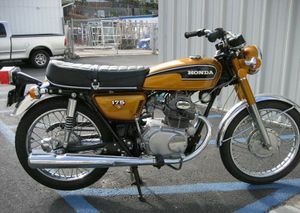 This 175K3 had separate speedo and rev-counters mounted in the 1970's style, the first Honda other than the CB250 to do so. 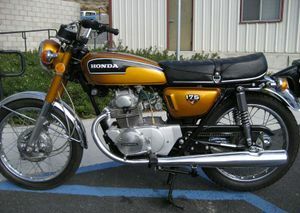 The CB175K4 Super Sport 175 was sold in 1970 and came in one of three colors: Candy Blue Green with White, Candy Gold with White, or Candy Ruby Red with White. The gas tank was two-tone with a black "HONDA" emblem. The "175" emblem was black with a white base. The electrical system was 12-volt. 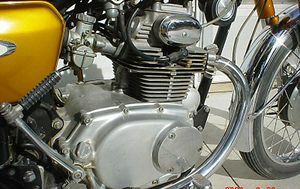 The engine was a 174cc OHC parallel twin linked to a 5-speed transmission. The serial number began CB175-5000001. 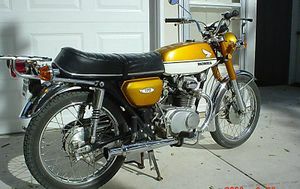 The CB175K5 Super Sport 175 was sold in 1971 and came in one of three colors: Crystal Blue Metallic with White, Candy Gold with White, or Candy Ruby Red with White. Dual pin stripes were added to the white section of the tank. The "175" side cover emblem was white with a black and chrome base. The electrical system was 12-volt. 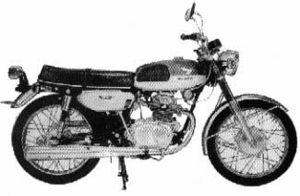 The engine was a 174cc OHC parallel twin linked to a 5-speed transmission. The serial number begins CB175-6000001. 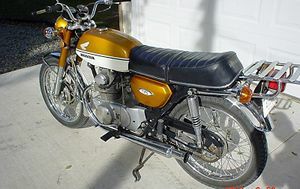 The CB175K6 Super Sport 175 was sold in 1972 and came in two available colors: Light Ruby Red or Candy Gold. The gas tank stripe was black with a white "HONDA" emblem. The side cover wing emblem had a red triangular base. The "175" side cover emblem was black with white lettering. The headlight shell was black. The electrical system was 12-volt. The engine was a 174cc OHC parallel twin linked to a 5-speed transmission. The serial number began CB175-7000001. 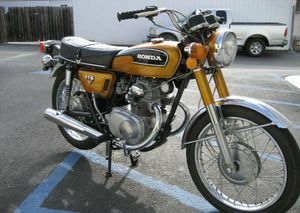 The CB175K7 Super Sport 175 was sold in 1973 and came in two available colors: Hawaiian Blue Metallic or Candy Orange. 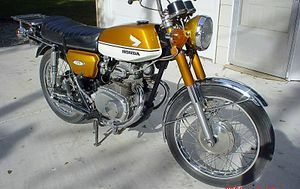 The white and black fuel tank stripe had a white "HONDA" emblem. The side cover wing emblem had a red triangular base. The "175" side cover emblem was white with black lettering. The headlight shell was black. There is a chrome grip pipe behind the seat. The instrumentation is tilted toward the rider. The electrical system was 12-volt. 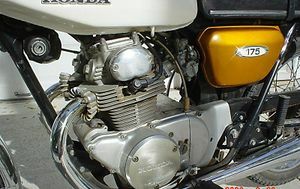 The engine was a 174cc OHC parallel twin linked to a 5-speed transmission. The serial number began CB175-8000001. This page was last edited on 20 January 2011, at 23:08.